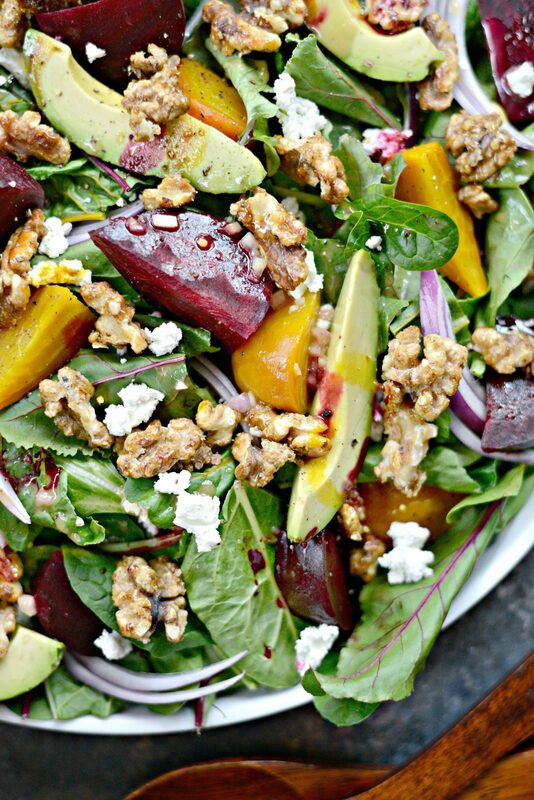 This might the best roasted beet salad ever. I was stuffing my face with this very salad when I got the news that a fellow classmate from middle school is engaged to Kid Rock. What? Like for reals. I know that he lives here in Michigan, and a few years ago my friend Heidi and I literally stood 2 feet away from him at a restaurant in downtown Clarkston. But really, what are the odds?! Crazy. So now I won’t be able to look at a beet salad and not think about how small the world is that we live in . Back to the beets. Okay so I really love beets, especially roasted. And their leaves in salads? Delicious. And if I could braid their beautiful gem colored stems and wear it as a bracelet, I so would. Okay so no I wouldn’t, but hopefully I’ve conveyed my enthusiasm and undying love for beets with that bit. 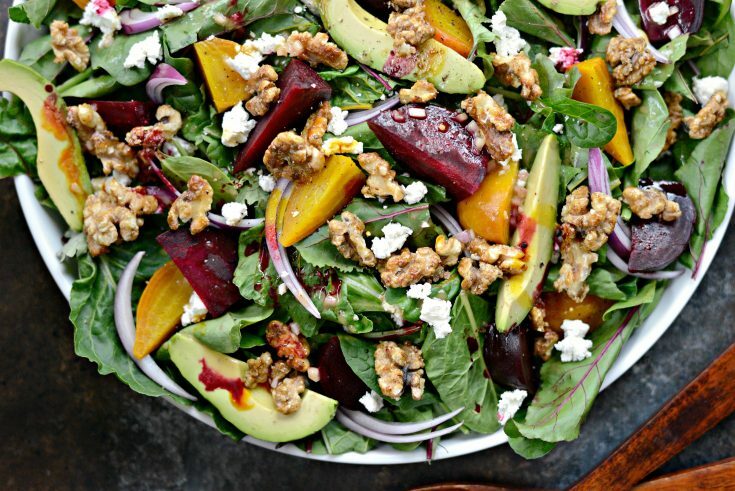 In this epic roasted beet salad, beet leaves are washed, chopped and tossed with a mixture of power greens and then topped with the sweet roasted beets, sliced red onions, freshly crumbled goat cheese (because the pre-crumbled goat cheese has a fuzzy texture like gym socks–ew), sliced avocado and candied walnuts. Lastly, the whole salad is drizzle with a homemade honey dijon vinaigrette and reserved roasting juices from the beets, creating this watercolor effect. So pretty. 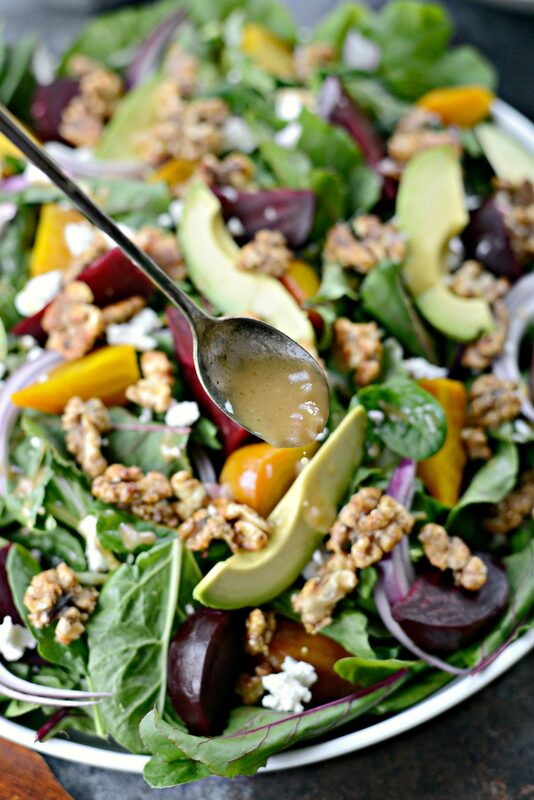 Need a gorgeous and colorful spring salad to serve on Easter? 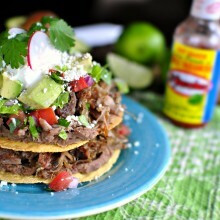 OR for lunch with friends? Look no further. I’ve got you. Okay so there’s lots of things going on with this salad, but each element is simple. I promise. Here’s what you’ll need: 5 ounces of your favorite salad mix (I’m using Earthbound Power Greens blend– because I love it and not because they asked me to ), two bunches baby beets (red and golden) with the leafy greens attached, half of a red onion sliced thin vertically, candied walnuts, avocado, goat cheese and honey dijon vinaigrette. Start by roasting the beets. First things first, preheat your oven to 400°. Now, to avoid the red beets from bleeding into the golden, I roast them in separate foil parcels. Lay two sheets of heavy duty aluminum foil (one per parcel or double up if using regular aluminum foil as it can easily tear). 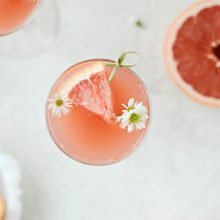 Cut off the stems and leaves then set aside. Wash the beets well, towel dry and place onto the foil. Drizzle with olive oil and fold up the sides to create a sealed purse. Place the foil parcels directly onto your oven rack and roast for 1 hour or until a knife pierces them easily. Allow the beets to cool a smidge before carefully opening the foil. Once the beets are cool enough to handle, use a paring knife to peel the outer skin and cut into quarters or sixths if the beets are large. I start with the golden beets and then move onto the red, then I pour the liquids that have accumulated in the foil, into separate bowls and set aside. Moving on to the walnuts. Have we talked about candied nuts and how they should be on every and alllll salads? Ever since this recipe, I’ve been obsessed with crispy, sugar crusted candied anything. This time it’s walnuts. 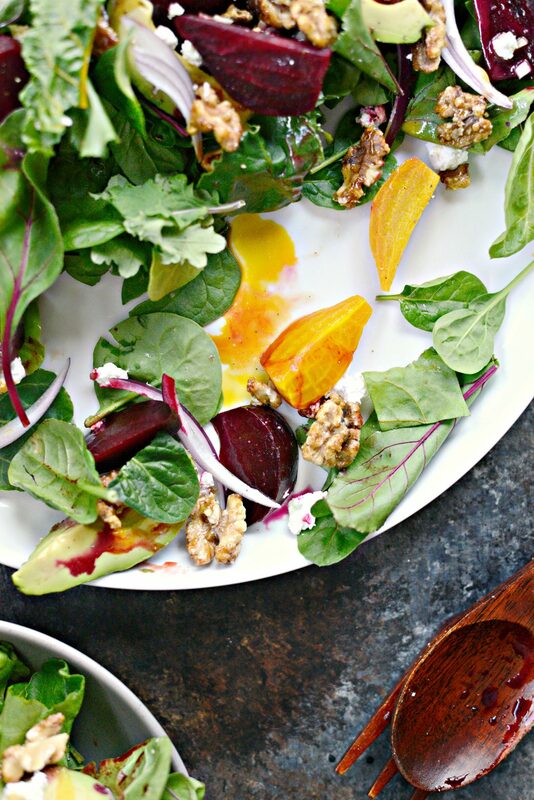 Walnuts go great in this salad, but candied walnuts go better. In a small skillet, place 1 cup of walnut halves and 1/4 cup of granulated sugar. Heat on medium to medium to medium-low heat, stirring occasionally until the sugar starts to melt, caramelize and stick to the walnuts. 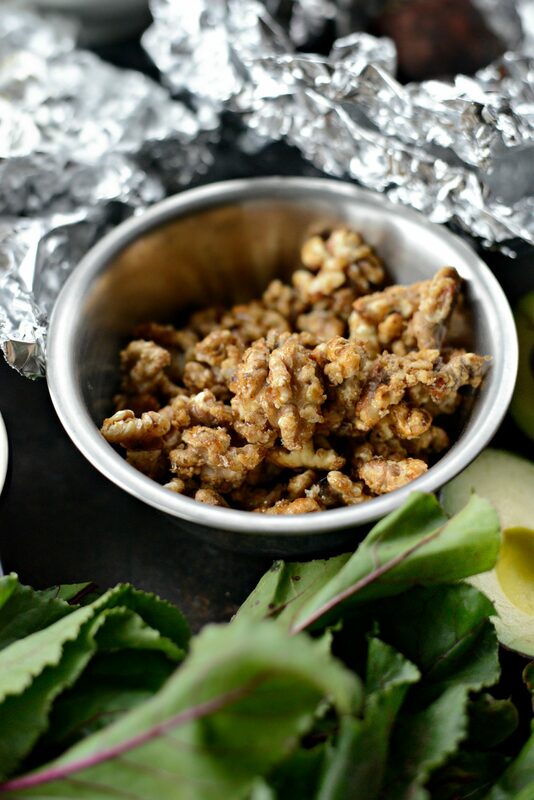 Stir constantly until the walnuts are well coated and toasted. Remove the walnuts off of the heat and transfer them into a heatproof bowl, and set aside. 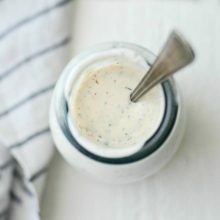 In a mason jar or container with a tight fitting lid combine: 1 heaping tablespoon minced shallot, 2 tablespoons dijon mustard, 2 tablespoons (good quality!) honey, 1/2 teaspoon kosher salt, 1/4 teaspoon black pepper, 2 tablespoons red wine vinegar and 1/4 cup of olive oil. Secure the lid and shake. 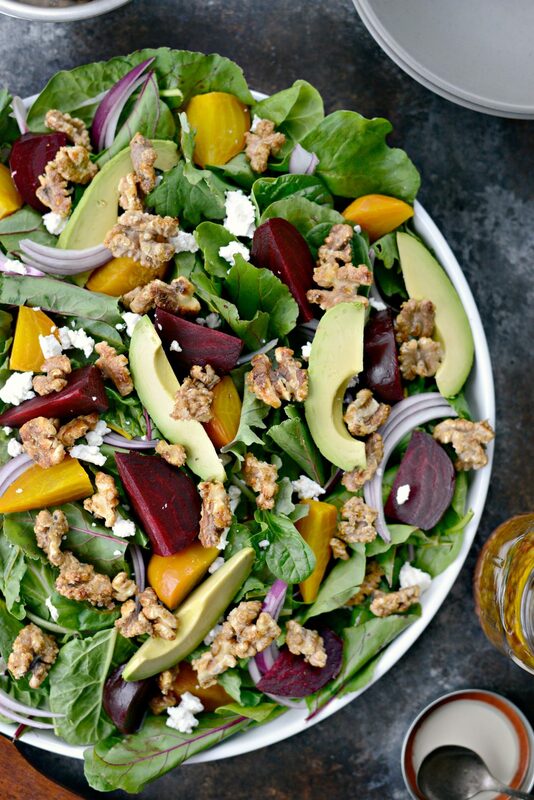 On a large platter or serving bowl, toss together the power greens, beet leaves and then top with the quartered beets, sliced avocado, crumbled goat cheese, candied walnuts and a few grinds of fresh pepper. 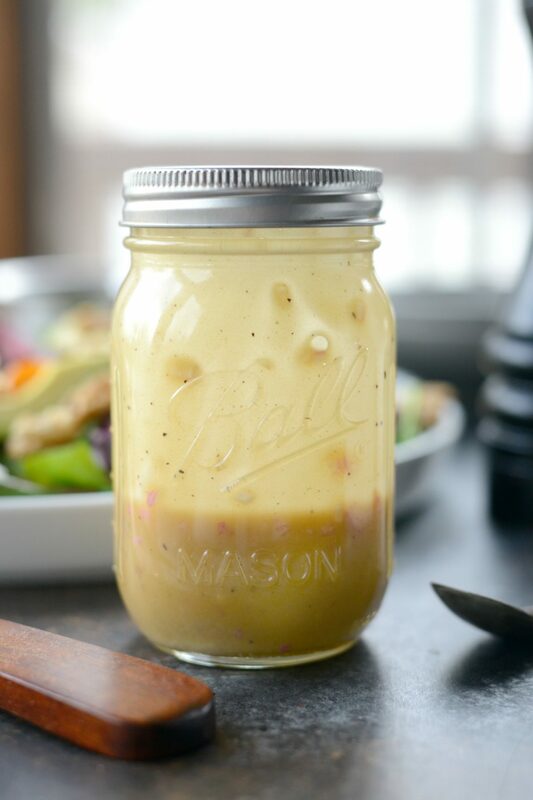 Spoon the honey dijon vinaigrette over the top right before serving. Then… and this is the exciting part, spoon the reserved beet roasting liquids over top. Gah! It’s so pretty it hurts! I am in love. I know, I know, I say that all the time. BUT it’s truuuuuue. 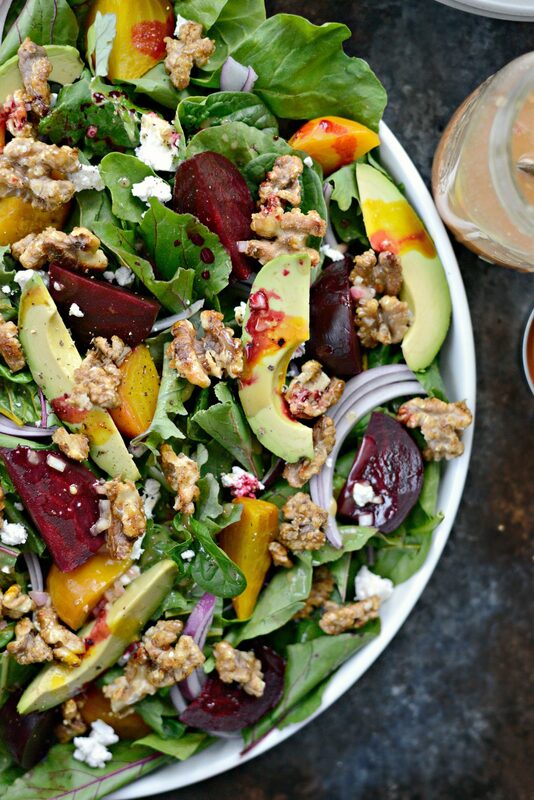 All of the ingredients work together harmoniously in this roasted beet salad and that dressing is so good it’s drinkable. Not even kidding. I wolfed this salad down as my lunch for TWO days. No joke. It’s meant to feed 3 to 6 but oh wells, I was hungry. 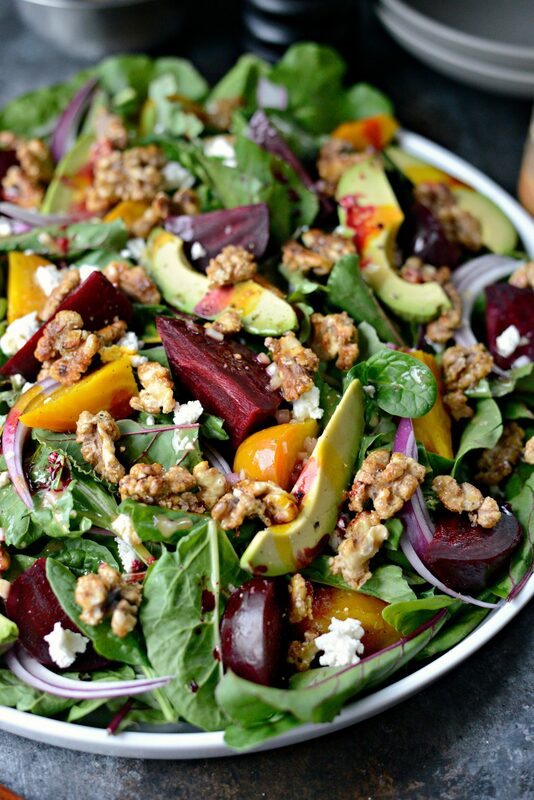 Roasted Beet Salad with Avocado, Goat Cheese and Candied Walnuts with a TO DIE FOR Honey Dijon Vinaigrette. The end all be all of beet salads. The End. FOR THE BEETS: Preheat your oven to 400°. 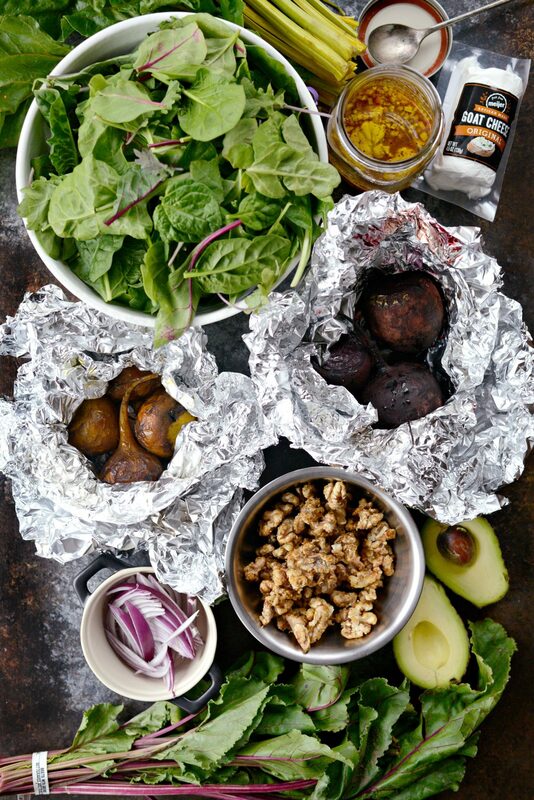 Place prepared beets onto a sheets of heavy duty aluminum foil (doubling up if using regular aluminum foil), golden beets on one and red beets on a separate sheet. Drizzle with olive oil and fold up the sides of the foil to create a purse. 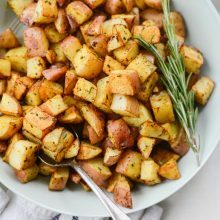 Place the foiled parcels directly onto the middle rack of your preheated oven and roast for 1 hour or until the beets are tender and can be easily pierced by a fork. Allow to cool before using a paring knife to remove the skin and quartering. Pour any remaining beet juices from the foil parcels into separate bowls. 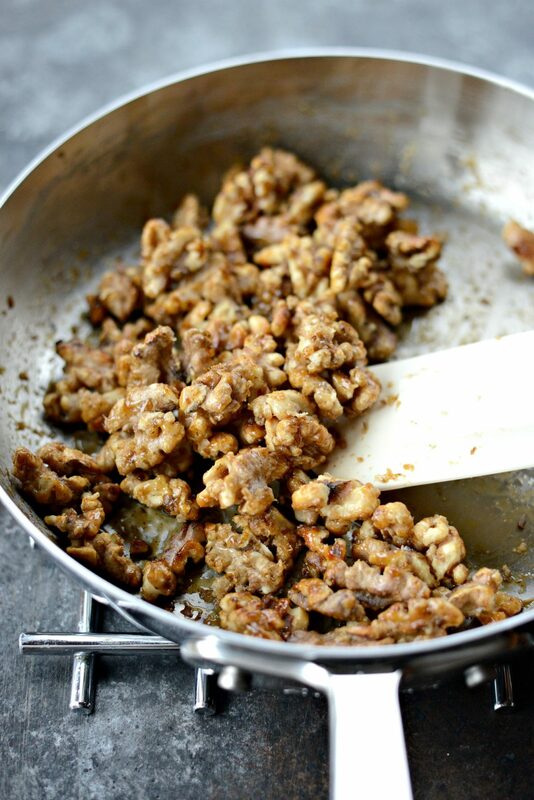 FOR THE CANDIED WALNUTS: Place the walnuts and sugar into a small skillet. Heat on medium, stirring occasionally with a rubber spatula until the sugar starts to melt. 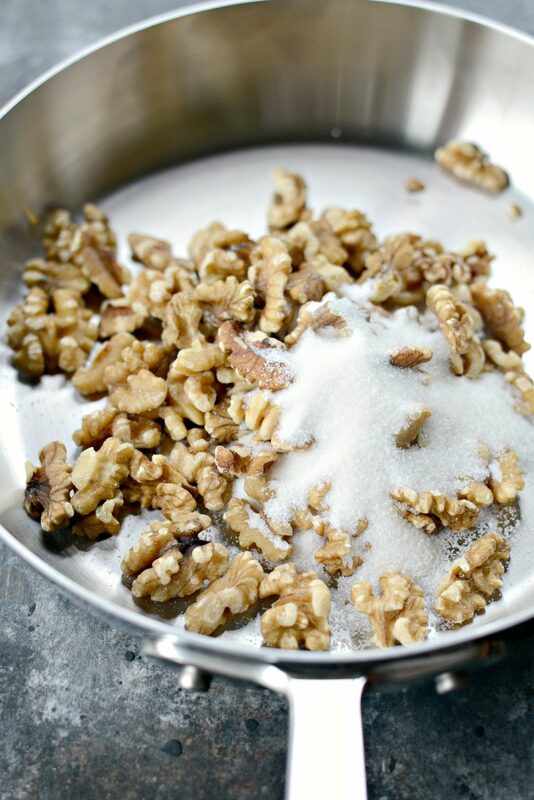 Keep stirring until the sugar caramelizes and the walnuts are toasted. Transfer the candied walnuts into a heatproof bowl to cool. 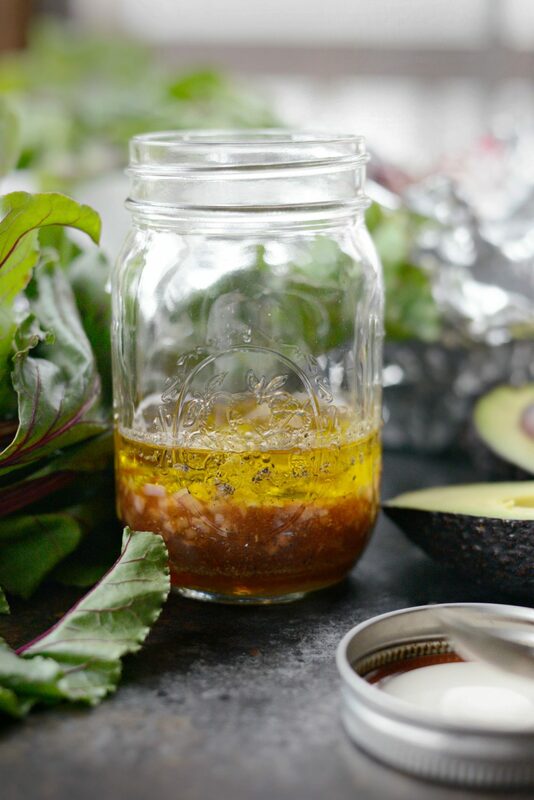 FOR THE HONEY DIJON VINAIGRETTE: Place the finely minced shallots, dijon, honey, vinegar, olive oil, salt and pepper into a glass mason jar or container with a tight fitting lid. Shake to combine. 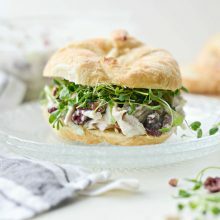 FOR THE SALAD: On a large platter or serving bowl, toss together the mixed salad greens with the chopped beet leaves. 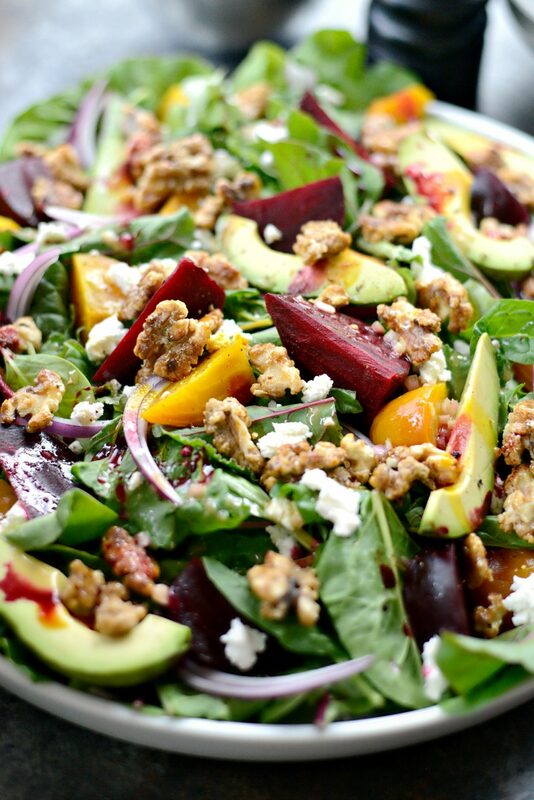 Crumble the goat cheese over top and add the slices of avocado, onions, quartered roasted beets and candied walnuts. Right before serving, drizzle with honey dijon vinaigrette and the reserved beet juices over top, then grind fresh black pepper over top. Goat cheese and beets are MAGIC!!! 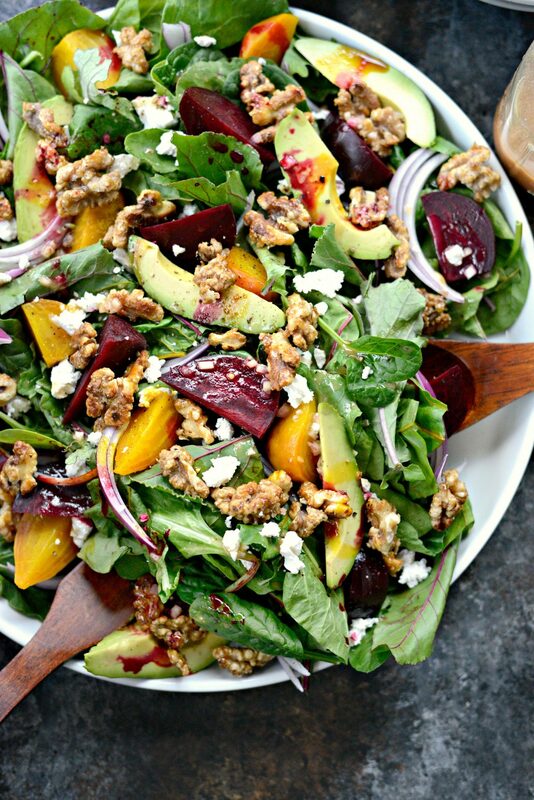 This salad looks so bountiful and delish! Just made this salad for our Memorial Day celebration, and it was the best salad ever!! Everyone loved it, and it was gone in seconds! 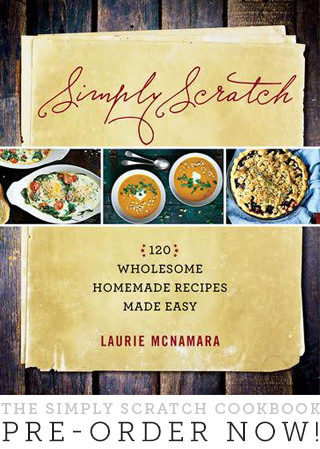 Thanks for another great recipe, Laurie!! Also, I have never roasted beets before, and your instructions made it super easy! 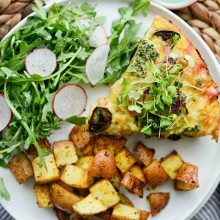 Wonderful salad! I roasted the beets, candied the walnuts and made the dressing the day before serving, which definitely sped up prep time. So smart! I’m so glad you enjoyed it, Mary Jane!